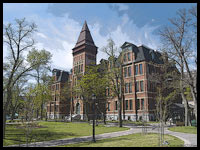 In 1912, Dalhousie University graduated its first four practitioners in the field of Dentistry. (Dr. J.A. Burke, Dr. A.B. Crowe, Dr. A.W. Faulkner and Dr. H.S. Tolson for any seriously specialized trivia buffs.) Next week (from May 23rd to 26th), the university will be celebrating 100 years and, “more than 3,400 dentists, dental hygienists, oral and maxillofacial surgeons, periodontists, prosthodontists, and graduates of the pediatric dentistry residency program” with Seminars, Class Reunions, a Golf Tournament, and a special Convocation Ceremony for the 100th graduating class. You can find a full schedule of events at http://daldentistry100.ca/ (along with an interactive timeline of the School’s history that includes photographs of graduates all the way back to those first four). Live HD Simulcasts of the Washington-based TEDMED 2012 conference (April 10-13) will be available at Dalhousie Medical School’s Halifax and Saint John campuses. HALIFAX: The April 10th opening session will be held in Theatre A, Tupper Link. Sessions 2-11 will be held in the MedIT videoconference suite (Tupper basement). More information, including a list of confirmed speakers, can be found at www.TEDMED.com.